Here's a random group of mini plastic charms I've had for years. I have vivid memories of getting most of them out of a small capsule machine at a laundromat as a little kid. This would have been in the late '80s or early '90s, but I wouldn't be surprised if they had been sitting in the machine for years before that. Strangely enough, I remember the same laundromat had another vending machine that specifically offered little boxes of those long balloons that clowns use to make balloon animals at kids birthday parties. I think that's the only place I've ever seen a balloon vending machine. Anyway, here we've got a nice little mix of dogs, hats, fish, horses, guns (maybe it seemed less weird back then for little kids to walk around wearing gun charms? ), and more. Even Satan is in on the fun. I'm sure my Mom was thrilled with me getting a Satan charm out of the cheapo toy machine. 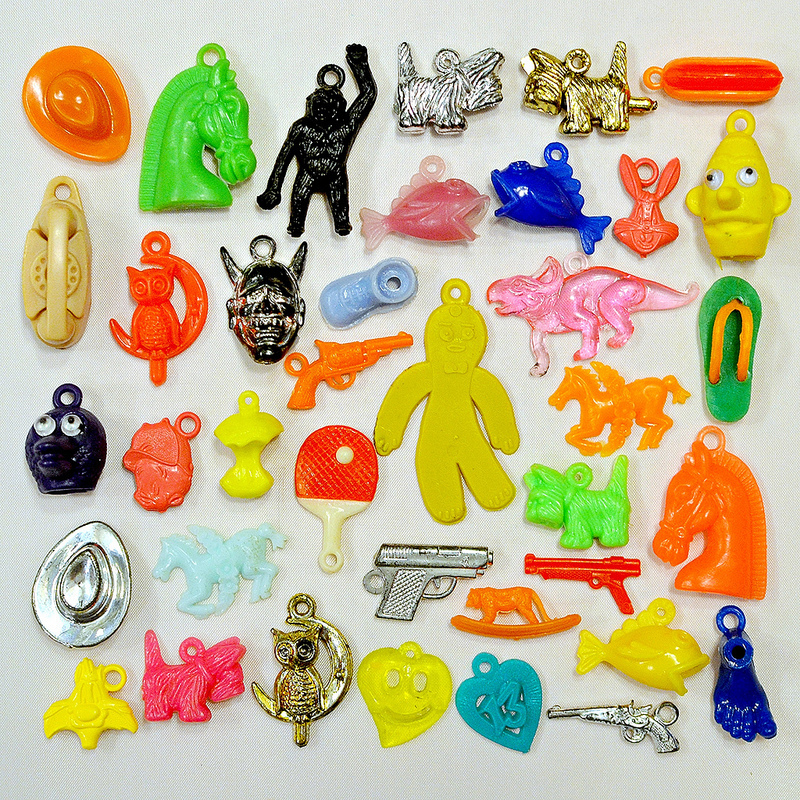 Who else remembers machines filled with these little plastic charms? I don't think that's Satan -- I think it's a Japanese Oni. Though given they're sort of demons I don't think your mum would have been thrilled anyway, haha! Love the Protoceratops! The mould for that smiley-heart-teardrop at the bottom is still in use, it was in Christmas mini-tree crackers a couple of years ago! Oh really? It's always surprising to see decades old molds still being used! I don't remember being able to con Mom into letting me have a quarter for these machines all that often, but Dad on the hand was pretty liberal with his stash of quarters. BTW, is is always a pleasure to read your posts and view your images of your stuff. Thanks for your comments. I am glad you enjoy the site! A friend and I once drained a capsule toy machine at a department store.It was during the seventies'Jaws craze, and the machine featured sea creatures.There was a shark,a sawfish,a whale,a turtle,and a snail.I saved my allowance for over 2 months(about 5 dollars in quarters) and my friend bought about the same amount.We were ater the elusive whale, which seemed to be short-packed.There was about 5 whales in the entire machine and more turtles than anything else.Fun while it lasted,but kind of anti-climactic.For any historians out there,the department store chain was called Jamesway. Fun memory. Did you ever get the whale? I got 3.My friend got 2.